The touring Marvel Universe Live! recently visited the Amway Center in downtown Orlando in December 2014 and all of the biggest Marvel Super heroes took over the venue for an extended weekend stay. Marvel Universe Live! is a brand new action tour from the same group that produces some of the biggest arena and stadium shows including Monster Jam, Barnum and Bailey Circus, and Disney on Ice. For Marvel Universe Live!, comic book fans finally get to see Spider Man join up the other Avengers of Iron Man, Hulk, Thor, Black Widdow, and X-Men favorite Wolverine to battle the bad guys. The entire production was very entertaining and was a mix-up that can best be described as a mashup of the Indiana Jones Stunt Spectacular at Disney World, WWE Wresting, and a Peter Pan broadway show. 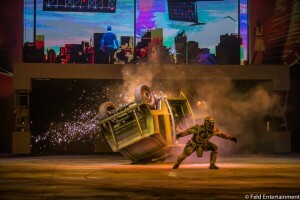 There are plenty of stunts, car crashes, and motor cycle tricks combined with choreographed fighting and martial arts along with super heroes flying through the air by a wire throughout much of the show to keep those in attendance very entertained. It all comes together very well and makes for a very entertaining couple of hours. Although the audience was skewed on the male side of fathers bringing their sons to the show, our six year old and three year old daughters, that know all of the words to the songs of “Frozen” by heart, enjoyed the show just as much and were engaged the entire time. Whereas the Marvel movies tend to be made for adults with children also enjoying them, the Marvel Universe Live! show had a little more of a comic-book feel to it that was a lot more action and not as much of the darker subject matters that the movies get into. In that sense, it is a great show for children of all ages. We are looking forward to see if they expand the arena tour franchise further with additional characters and different plot lines as they do with their other arena tours. Disclaimer: Orlando Local Guide was provided with complimentary tickets for Marvel Universe Live! to help spread the word about the show. The opinions in this review are of the author of Orlando Local Guide. Check out our video highlights of the show below and our bonus video of the merchandise available for sale.